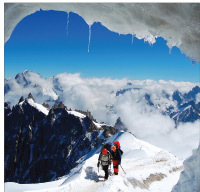 Look no further because we've got The Great Ice-scape coming your way! For this brrr-worthy photo shoot our creative team transformed a warehouse loading dock (yes you read that right) into a snowy forest getaway. Fir trees, a snow-lined floor, and a "frozen" pond for ice skating completed the winter vibe and helped our model feel like she had been transported deep into an icy forest. 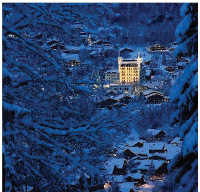 If skiing is your winter sport of choice then you've got to hit the slopes in Chamonix. Novices beware because these inclines are steep! Founded in 1913, this architectural masterpiece is actually a functioning hotel. Over the years, famous guests have included Grace Kelly, Elizabeth Taylor and even Princess Diana. 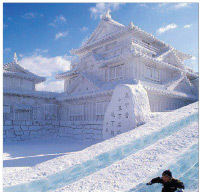 Every February guests gather for a seven-day festival and contest in Sapporo, Japan. Hundreds of sculptures with a special theme are created for the event, a.k.a. the world’s largest ice sculpture contest.